Join us to see and discuss new plans for the area surrounding the city’s light rail transit station! View of Bass Lake Road looking east to County Road 81, along a promenade connecting shops with the proposed LRT station. Monday, January 25, 6:30 to 8:30 p.m.
Station area planning for the Bass Lake Road light rail transit (LRT) station launched in September with a community-wide meeting, where Crystal residents talked about the strengths and weaknesses of the station area and their vision for it. 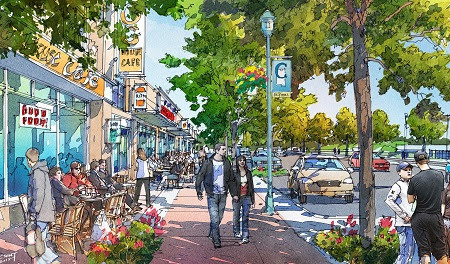 The process continued in early November at a three-day design workshop, where the community input was used to develop initial design concepts for the station area, which were shared at a November 5 community meeting. Join us to see how that feedback has informed the latest concept plans, and to share your comments. Contact bottineau@hennepin.us or Denise Engen at 612-348-4454.